Anna Sui is truly one of a kind. Forever the underdog of the week Sui is still not one to miss. She is one who never shies from a hippie-happy ’60s-’70s mash-up played true to form at her runway show on Monday at Skylight Clarkson Square, home of New York Fashion Week. 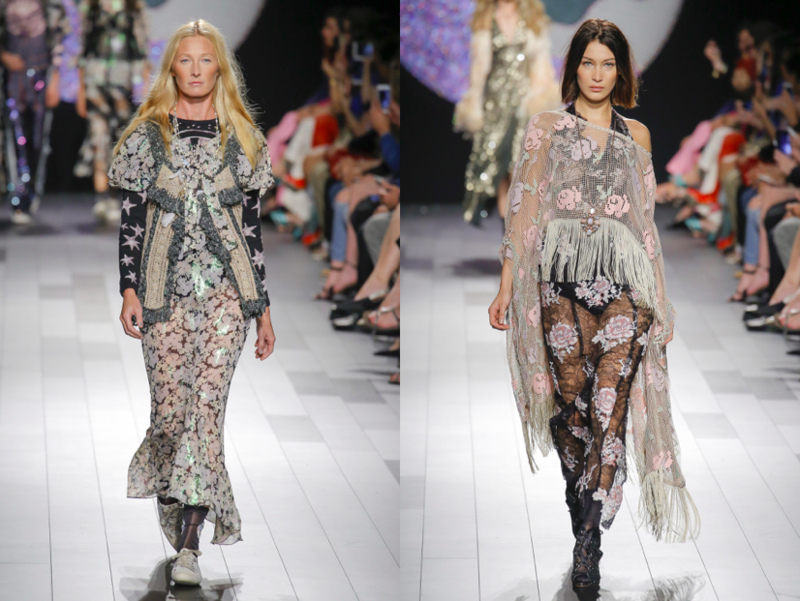 The Spring 2018 collection was a strong array of peasant dresses, lace and crocheted cardigans, and all-around granny chic ensembles. The cover of the program was collaged with phrases like “counter culture” and “stardust.” And fans will likely snap up the Sgt. Pepper embroidered denim cape or the vintage tie-dyed Levi’s shorts. The show started with dimmed lights and all the models taking a revolving turn around the runway en masse, which could have been shown as a sign of respect that it was September 11th. 16 years after the tragic events of 9/11. Shying away from a big show Sui still had ‘IT’ sisters, Bella & Gigi Hadid walk and at one point – arm in arm. Their was strong signature of optimism in the collection that was truly inspired by creativity, freedom strong infinite possibilities. This entry was posted in New York, Trend Reports and tagged Anna Sui, Bella Hadid, Gigi Hadid, nyfw, Spring 2018. Bookmark the permalink.